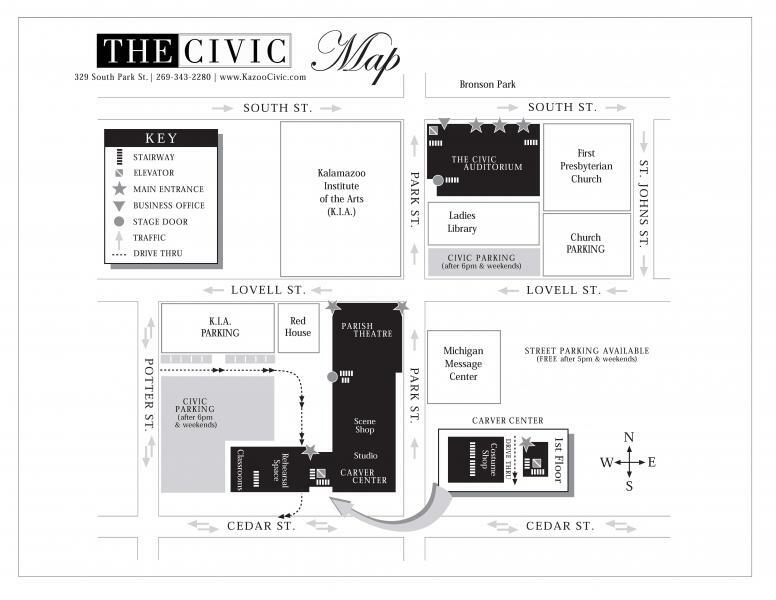 The Kalamazoo Civic Theatre is comprised of three performance venues, which are located are in the heart of downtown Kalamazoo and accessible from all directions. The addresses noted below can be used when programming a GPS or any other online mapping system. Please don't hesitate to give us a call at 269 - 343 - 1313 if we can be of assistance. All venues are in close proximity to free off-street parking and on-street parking, which is free after 5:00pm and on the weekends. The Auditorium parking lot is located at the corner of Park and Lovell Streets with access from each street. Parking spaces in this lot are reserved Monday through Friday from 7:00am until 6:00pm. Free parking is available in this lot after 6:00pm and on the weekends. On-street parking is available in the area immediately surrounding the Auditorium. Parking for the Parish Theatre is located behind the building and may be accessed from Potter Street or Lovell Street. Parking in this lot is free of charge at all times. The Auditorium lot located on the corner of Park and Lovell Streets may be also be used after 6:00pm Monday through Friday and on the weekends. Parking for the Parish Theatre is located behind the building and may be accessed from Potter Street or Lovell Street. Parking in this lot is free of charge at all times. The Carver Center Studio and the Parish Theatre share the same parking lot. Click here to download and print a copy of this map.